Students at the University of Southern California (USC) have produced a virtual reality (VR) experience that aims to prepare audiences for inevitable coastal storms in Houston, Texas, offering an alternative use for immersive VR technology within the journalism industry. Hell and High Water VR, which is based on research by ProPublica and The Texas Tribune conducted in March, uses a mix of computer-generated imagery (CGI) and 360-degree video to show viewers the destruction that a hurricane would cause to the local area if it hit the Houston Ship Channel, one of the country's biggest petrochemical refining centres. "The ability to take you to a place that allows you to look around is wonderful, but the ability to illustrate and give you a sense of scale is something that virtual reality can do better than anything else," explained Robert Hernandez, project lead and professor at USC's Annenberg School for Communication and Journalism, who wanted to use the medium to raise awareness of the issue through journalistic pieces. "It's a known local story that Houston is incredibly vulnerable to hurricanes. They could cause an environmental and economical disaster, and potentially kill hundreds of people, so we used VR to give audiences a better sense of what is at stake. "A lot of people forget that Hurricane Katrina was predicted by the local paper years before it actually happened – it was a front page story, but a lot of people dismissed it, so we wanted to help people avoid making that same mistake." USC Annenberg students developed the project last January as part of Hernandez's class, 'Hands on with disruption', under a brand called JOVRNALISM. The VR experience is available on YouTube and through the JOVRNALISM app. Hell and High Water VR interlinks both animated and spherical video footage to illustrate portions of the ProPublica investigation they felt were suited for virtual reality, such as a trip to the homes of previous hurricane survivors and an animated demonstration of a storm surge. "ProPublica approached us about their findings, but didn't tell us what to do. Instead, they wanted us to look at the story and work out how it can be enhanced in VR, so we did our own original reporting based on their research," he said. "We flew to Houston for three days during spring break, where we captured all the interviews and footage – it was amazing to see how the students all bonded together to figure out how to pull it off." The group used GoPro rigs to film 360-degree footage of a street next to the water in Houston, which was then mixed with CGI footage of a 30ft wave approaching a computer-generated house nearby, which demonstrated the scale of disaster a storm surge could cause. But prior to any production, Hernandez noted that students grappled with the ethical questions that are raised when creating virtual experiences that give audiences a vision of what could happen in real life. "I can put you in any situation that I want, but that is not necessarily journalism," he said. "When we first started to brainstorm how to portray a storm surge, the students thought about putting the viewer in the house where they could hear the wind howling before the roof is dramatically ripped off from the storm outside – and then I stopped the class and reminded them this wasn't a Hollywood movie. "We're not doing this because it's cool, we're doing this because it's journalism." The final product stripped the experience back to simply placing the viewer on the street, where they can see the scale of the wave coming toward them and the houses, with animated text to help them appreciate the power of the water. The wave stops before it hits the house in order not to give any misinformation as to what would happen next. "When we first worked with a CGI artist, he put in rain and all that stuff, but I didn't want that. The texturised wall of water that comes to you is as simplified as possible to illustrate the scale of a 10ft wall and then a 30ft wall," he said. "It is an infographic but in an immersive way – a lot of folks in journalism are nervous about how we are going to ensure that something is ethical when you can recreate the world in any way you want, but as journalists we subscribe to ethics, and those ethics don't go away with a new piece of technology like VR." 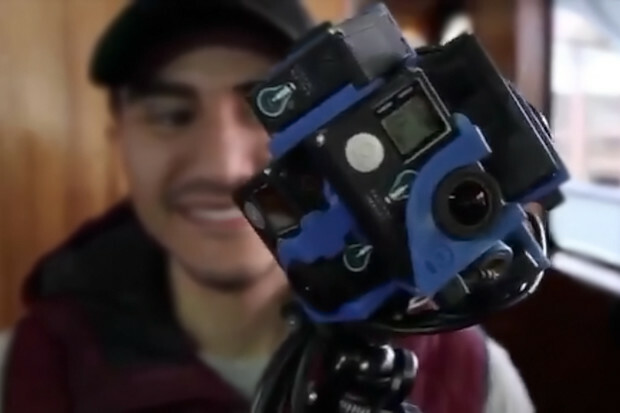 The university has had support from a variety of companies who have been providing the class with equipment and services, but 90 per cent of the work was done by students, Hernandez explained, who had little to no experience with virtual reality, having just started building their skills by experimenting with different tools and techniques. The JOVRNALISM class will be partnering up with the Centre of Investigative Reporting this semester, to work on VR experiences about the California draught, using drones and immersive video. "Every semester, the learning curve is dropping with how to pull these kind of projects off – our advantage over the VR industry is that I have students that are not held back by legacy, bureaucracy or justification of the return of investment," he said. "The whole point of what we are doing at USC is to try and figure it out – if we fail, we fail, but if we succeed, we share our knowledge with the industry. "We hope Hell and High Water VR moves the industry forward in terms of understanding how virtual reality could be used."